I recommend the post-compo version as it allows you to adjust the volume. Connect components to match the waveform to the gate to open it. Use your oscilloscope to view the power waves and see how they differ from how they should look, you’ll need to reroute power through the correct modules in order to open the protected gates and continue. Mac version is in the works and possibly a web port, although some of the audio techniques used might make it difficult. Each module has sockets, input sockets are blue, output sockets are orange. Input sockets are on the left, output sockets are on the right. You can attach cables between sockets. A cable must go from an input to an output socket. You cannot connect an input to an input or an output to an output. Oscillator: generates a signal, shows the waveform output. Later, some oscillators have an input socket which uses the input signal to modulate the phase of the oscillator. 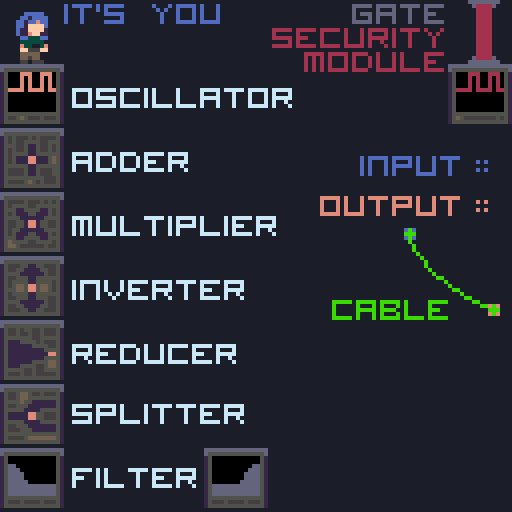 Connect a signal to the security module, if the signal matches the one displayed on the security module, the gate will open. You can compare the input and output on the oscilloscope. Adds two inputs signals together and outputs the summed value. Multiplies two input signals and outputs the result. Requires two inputs to generate a non-zero output. As the values are in the range -1.0 to 1.0 the multiplier does not increase values. Anything multiplied by 0 will become 0. Anything multiplied by a small value will become smaller. Anything multiplied by 1.0 will stay the same. Anything multiplied by -1.0 will be flipped. For me, it was rather easy and interesting to try, but there's a couple of things that prevented me from playing it more. 2) I NEED an ability to remap keys, or at least an "hand-alternate" version, where I can move with WASD and act with sometimg else. I can't count how much I stumble trying to alternate between Z, X and C and ended up disconnecting things I didn't want to, going overboard with actions I didn't want to happen. Eventually, I was just tired. 3) It would be nice to have a save state or at least to make timer and sound stop when you minimize the app. Thanks for playing! I'm working on making it a lot easier and explaining how it works a lot more! Really cool game! your waves are out of sync though, the goal waveform (and the way the waves you have interact) changes as time passes, I was going to add two screenshots I took to show this, but for some reason the add image thing wouldn't load, but if you wait a bit in a level it's easy to see the change. it makes it harder to visualize when your goal is moving. Also, if you plan to keep working on this, it might be a good idea to add the option to see the waves standing still, the movement makes it a bit harder to visualize how they add and multiply, and maybe always have the zero line, to more easily identify when the wave is negative and when it is positive. It's also cool that this concept allows you to think in two different ways to solve a puzzle, because you can also think about it as the intervals formed to solve it, which is what I did occasionally to bypass the phase desync problem, since the frequencies don't change so you hear the same result, though it's a bit hard, since you can have three waves at octave intervals, and in the result you hear a third, but it's because modulation changes how they relate differently than addition. It might be a good idea to exploit the possibility of solving the puzzles musically, by adding a way to visualize how frequencies interact, or teaching how they interact in terms of intervals, so there's two paths to solve each puzzle, by visualization or by hearing. Is having a timer a good idea for a puzzle game? It's kind of stressful, specially if the game doesn't tell you what the timer is for, and it made me want to pause the game while I pondered the solution. Yep that's a known issue. I'm reworking a lot of things to make it a lot easier and introduce concepts more slowly. And give better tools to solve puzzles rather than having to guess. I'll be making a mac version, I had some issues with building it and didn't have time to fix it before the deadline unfortunately. Ahh me too. You know porting is allowed post deadline? Yep, I'll get to it, but had some troubles with dependencies on macos.